I finally managed to complete my second reading of Through Gates of Splendor: . I was so glad that Barbara chose it for last month's book club selection as I hadn't read this since high school. As Barbara (and others) have already shared the basic plot and story of the book, I will stick to discussing my impressions of it. 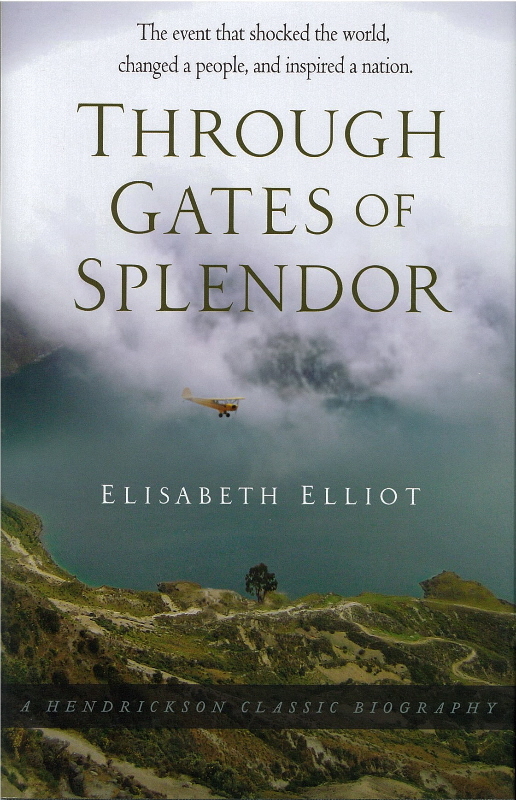 I remember reading Through Gates of Splendor for the first time in high school and thinking that Jim Elliot was an incredible but CRAZY man who would offer up his life to strangers, particularly since he had a wife and child to think about. But his heart was totally focused on the work that God would have him do in potentially bringing the Gospel message to the Auca Indians. This time I read the book focused more on the history which has transpired since the time "Operation Auca" was commenced. Mostly I focused on the attitude of the wives and the way which they came alongside their husbands and supported their mission unto death (and then beyond). What struck me most was the calm assurance that each wife had that her husband was doing the will of God and therefore there was nothing to fear. Yes, there were things to be sad about and also to mourn, but they did not grieve hysterically and/or without hope. Death has touched our family a few times now and I really despise it. I understand that we must all go through it now, thanks to sin, but I dislike it. It's dirty and painful and so very, very ugly. It drags you to the pit of despair and questions your hope. I truly hate it and its effects. I still violently recoil from the pain of the hole that is left when a person that is close to you - whom you really loved - dies. It is final, as far as life on earth is concerned. The idea of gladly walking one's husband to the brink of death, knowing that you and your children will bear enormous consequences, is mind-blowing. "I want to be free from self-pity. It is a tool of Satan to rot away a life. I am sure that this is the perfect will of God. Many will say, 'Why did Roj get mixed up in this, when his work was with the Jivaros?' Because Roj came to do the will of Him that send him. The Lord has closed our hearts to grief and hysteria, and filled it with His perfect peace." "God is God. If He is God, He is worthy of my worship and my service. I will find rest nowhere but in His will, and that will is infinitely, immeasurably, unspeakably beyond my largest notions of what He is up to." That is faith that allows for godly hope. It is hope grounded in solid and correct theology. God is God. He is sovereign and I am not. He is working in the world in ways I cannot always see and most times do not understand. But because He is sovereign, I can (and should) trust Him to be working things together for my good and for His glory. Always. He is faithful and can give us the strength we need to bear the hardship of any death we may ever experience, even when it comes to walking through our own. He is good enough and big enough to see us through the pain. And therefore, He is deserving of our praise and our thanks, no matter the circumstances we find ourselves in. Repeating such truths to ourselves during the hard moments will bring us the only relief that we can truly hope for and rest in. I thought Elliot told this missionary story very well. I tracked with the timeline of events quite easily. I had no issues comprehending what the men hoped to do and why. Her writing style keeps you engaged with the proceedings. I also very much appreciated that she concluded by explaining that the story of these five men, who wanted to reach a secluded and violent tribe of Indians back in 1956, is told strictly to share what God had worked in this one instance and in this one particular way. "This is the context in which the story must be understood - as one incident in human history, an incident in certain ways and to certain people important, but only one incident. God is the God of human history, and He is at work continuously, mysteriously, accomplishing His eternal purposes in us, through us, for us, and in spite of us." It is a truth we can't avoid, even if we want to. Understanding it and believing it helps you to see the beauty which is indeed growing out of the ashes. It helps you to grow in faith and to praise God even in the storms of life, knowing that He has always been and always will be. If you have not yet read this book, I highly recommend it to you. It is a great encouragement and not one to be avoided! I agree, the faith of the wives was every bit as remarkable as the faith of the men. To encourage them knowing that there were such risks - and while on foreign soils, with no family nearby to comfort and help - it's a rebuke to me, but an encouragement as well, that even if the worst happens, God will uphold and give grace to deal with it. One passage I had underlined but didn't include in my review was how Marj thought her post by the radio was every bit her ministry as much as her husband's flights were his. It is pretty helpful to have your notes in the book.